Miki is Miyu's astronaut mother who is obsessed with anything connected to outer space and is hired by NASA, along with her husband, Yu, at the beginning of the story, thus having to leave for the United States, arranging her daughter, Miyu, to live with the Saionjis. Her two childhood dreams were to have a beautiful daughter and to become an astronaut, both of which came true. 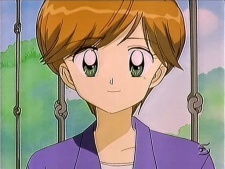 She was friends with Kanata's mom ever since she was a teenager.